“My dream was to become a football player, but I felt hopeless about my dream because my parents and people demotivated me all the time. I was not encouraged to play football and my parents forced me to study hard or spent more time helping their work. Those made me depressed and anxious. I started crying myself to sleep every single night. However, I never give up my dream and keep praying. Thank God for letting me meet the opportunity which you offer. I was recruited by TFCF and become a football player! At the beginning, my parents did not allow me to join until my teacher explained to them that TFCF program would be much helpful to students. My parents were convinced by my teacher and agreed to support my dream to stay in TFCF football team. I promised I would do my best and be disciplined, diligent, patient and persistent in my training and my studies. The goal of this year is to win one champion match in our province, and make our parents proud of our achievements. ** Visal is the fake name due to the privacy and safety of individuals is respected. 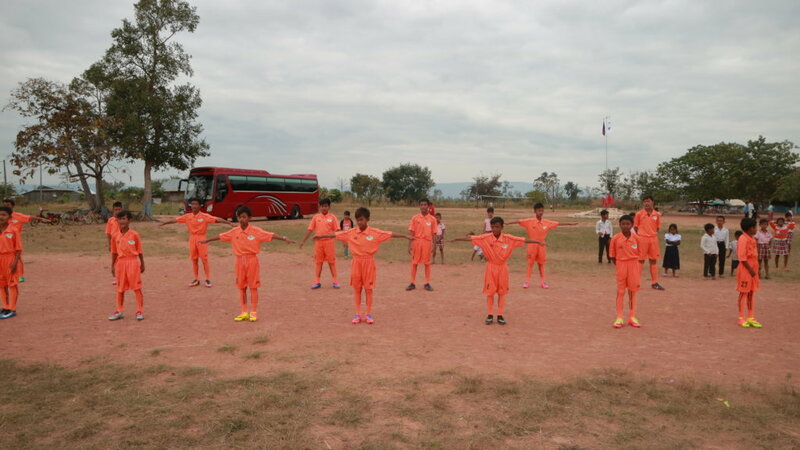 TFCF Cambodia has cooperated with DPC School (Organization of Development for People of Cambodia) and formed a football team at Oddar Meanchey Province. Both of us have the same objective which is to stop schoolchildren from dropping out of school in Cambodia. Education is the key to helping poor children; however, almost half of families still force their children to drop out of school and work for them because of financial difficulties. It’s not an easy task to stop and change this situation but we still decide to provide our assistance. We have formed the TFCF Football Team since April 2017. We have 25 team members currently and provide team uniforms, including clothes, socks, shoes, and some training materials. At the beginning, we found that it was difficult to find a good football coach because we were far away from Phnom Penh. Praise God! We now can find one permanent coach who is a professional coach in DPC School, and he has enough capability to train our team. We have made contract with the coach for one year, and he will help provide the training to our team members every Tuesday and Friday morning from 8AM to 11AM. The class will provide programs, including football techniques & skills practices, warming up, playing with their teammates and how to touch a ball. The coach has commitment to leading our team members to win one competition in Oddar Meanchey Province at the end of this year. As we have seen, schoolchildren have opportunities to stop dropping out of school. We need your help to give them a chance to make a change. It’s still a long way to go, and we know you will stay with us and give schoolchildren in Cambodia a dream of their future.